[SatNews] Mischief Reef is no misnomer considering these circumstances. Vietnam has carried out significant land reclamation at two sites in disputed South China Sea waters, recent satellite pictures show, but analysts say the scale of the work is dwarfed by that of China. 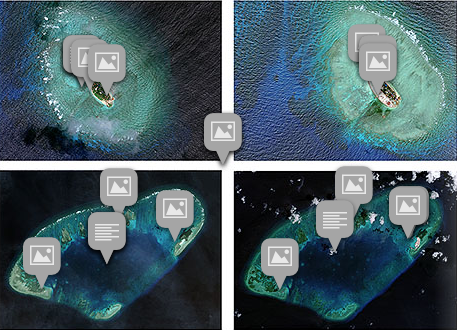 The images, taken late last month by DigitalGlobe and shown on the website of the Washington-based Center for Strategic and International Studies (CSIS), reveal land expansions at Sand Cay and West London Reef, both part of the Spratly Islands. "Between August 2011 and February 2015 significant upgrades were made to (Sand Cay)," CSIS said, noting the island's land mass had expanded from 41,690 to 62,970 square meters. Vietnam also appears to have added "defensive structures," including trenches and gun emplacements, it said. At West Reef, which is part of the London Reefs group of western Spratly Islands, some 65,000 meters of land have been reclaimed with new structures, including a harbour, being added, it said. The work appears to have begun in August 2012, CSIS said, long before Beijing launched a flurry of reclamation projects last year. The Spratlys are considered a potential Asian flashpoint, and the United States and claimant nations have expressed alarm as China has embarked on massive and speedy reclamation activity. China claims nearly all of the South China Sea, locking it into disputes with several Southeast Asian neighbours. Its claims overlap those of Brunei, Malaysia, the Philippines, Vietnam and Taiwan. China has undertaken major reclamation work on seven Spratly features in the last year. "Chinese activity is clearly on an entirely different scale," said Vietnam expert Jonathan London of Hong Kong's City University. "Vietnam appears to be now trying to strengthen its position with added urgency," London said. "Not only is there a sort of regional arms race but a rush to claim maritime areas, rock features and things of this nature," in disputed waters in the region which is a key global trading route, he added. Some $5 trillion of sea-borne trade passes through the area each year. China's island-building in the Spratlys has been seen as part of an attempt to assert its territorial claims by establishing physical facts in the water. Fiery Cross in the Spratly Islands was little more than a reef until last year when China began reclamation work. It now has a partially-finished airstrip with a 3.1 kilometers (1.9 miles) runway. It also appears to be undertaking work at a feature known as Mischief Reef, just 100 kilometres (60 miles) from the southwestern Philippine island of Palawan. Vietnam has an airstrip on the largest Spratly Island it controls, which was renovated in 2000 and can accommodate helicopters or small planes. Vietnam's Ministry of Foreign Affairs did not immediately respond to a request for comment on the new satellite images.